Oh goodness it was wet today – got totally soaked on both my walks. I blame Jackie for saying it was summery yesterday – ridiculous behaviour – a bit like when she took suncream on our camping weekend on the last May bank holiday – asking for trouble. 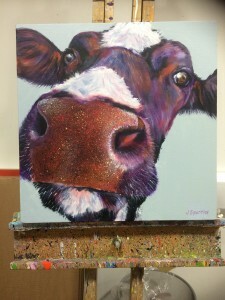 Anyway, in between drying off I’ve been watching her manically painting cows. 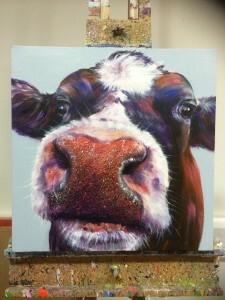 She seems to be busy painting little cow canvases for an exhibition in a funny sounding place –Tacchi-Morris – Bless you! It must be soon as she is quite frenetic.